Beauty of whatever kind, in its supreme development, invariably excites the sensitive soul to tears, Edgar Allan Poe, 19th century American Poet. Proustite, Chanarcillo, Chile (3.8 cm tall). Wendell Wilson photograph. This is the first very fine proustite I obtained for my collection in 1983 from Simon Harrison. Click on photographs to get full-size versions. 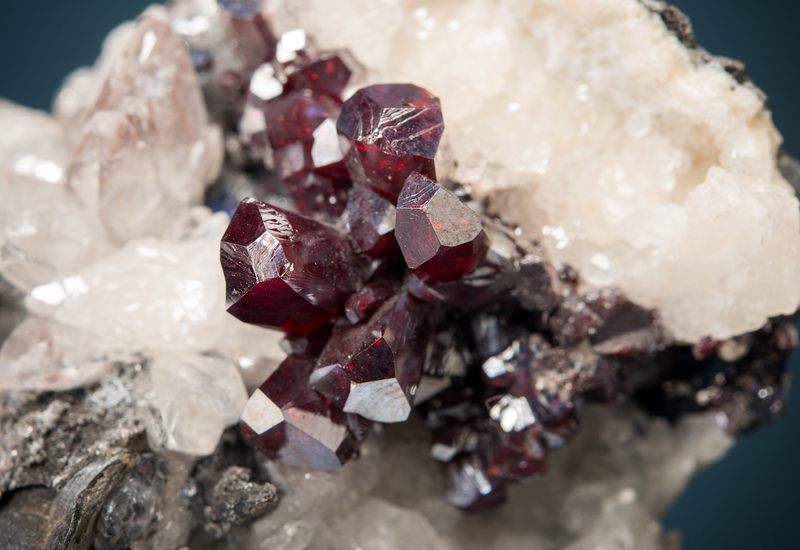 There are certain minerals that hypnotize the collector – some with their monetary value, some with their art esthetics, and others with their specimen fame and history. A few appeal to a most primal attraction, a fascination with a rich and distinctive color. 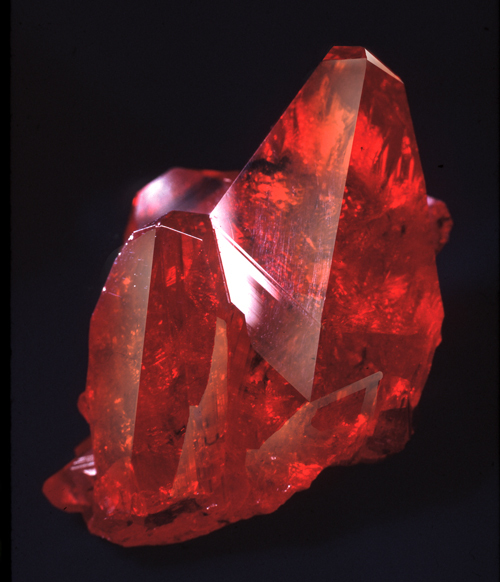 Perhaps no species in the mineral kingdom has a more unique and appealing hue and chroma than proustite; vermillion-scarlet red, appearing to glow under moderately bright light, yet fleeting and fading with time. In Mexico and Chile, miners use the phrase “Sangre de Toro” – the Blood of the Bull – when they encounter freshly broken rock that exposes proustite (or the closely related mineral pyargyrite). These miners celebrated the rock bleeding with rich silver ore.
A “great proustite” is prized in any mineral cabinet, and is considered an essential in a great mineral collection. However, proustite is enigma to most collectors — beautiful, but it poses very special challenges in terms of curation. 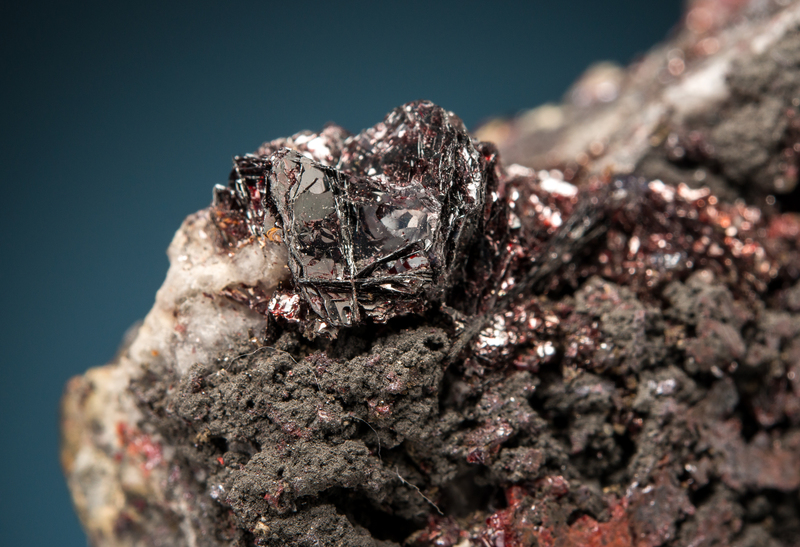 Proustite is well known to darken on exposure to light – mainly sunlight, but also on exposure to the light from most electrical bulbs found in mineral cases. Proustite is probably the only mineral that is proudly advertised as “stored away in a dark box for the last 100 years”. A great mineral that no one every gets to observe? By far, proustite is the mineral I get questioned must intensely about; Can you reverse the darkening? Why does my proustite that I leave boxed up develop a white coating? Can I find display glass for my mineral case that will block damaging light? Unfortunately, the same chemistry and physics that endows the mesmerizing color to proustite leads to its ultimate demise. I bought my first fine proustite in 1983 at the Tucson Gem and Mineral Show — or more correctly, I bought it late one evening in a dingy hotel room in the Desert Inn located a few blocks west of the TGMS show. The crystal is about 3.8 cm high, and distinctive in its habit; there is no question that it was from Chanarcillo, Chile. I was introduced to an English mineral dealer named Simon Harrison, who was reported to have a fine proustite. Simon took me into the bathroom to show me the piece — I recall that the bathtub was filled with ice and cans of beer, and there were mineral flats stacked high — and as I opened the box I was incredibly excited (the crystal is shown at the top of this article). Inside was a perfect prismatic crystal, fantastic color, and an retired British Museum of Natural History label. Reality splashed over me as I realized this piece was probably out of my meager means — having just completed my PhD, and was only notionally visualizing what a “paycheck” was. He told me the price was 3000 dollars – cash, no stink’in checks. I quickly said yes, but had no clue where I was going to find 3k. I had three flats of pretty good material in my car out front, and I hoped to sell them in the next couple of days. I was incredibly lucky that I was able to cajole a dealer to take them all for 3,800 dollars, and I became the proud owner of a piece of ruby silver. Labels from the Chilean proustite pictured above. The label on the left is from the British Museum of Natural History, and documents that the specimen was purchased in 1865 from Steve’s Sales Room. I showed my treasure to a number of friends and colleagues and the everyone told me it was great, but that I had to keep it closed up tight in a box, and make sure it never saw the harsh and bright Tucson sunlight (I recall thinking that perhaps everyone was confusing the proustite with a miniature vampire…). I stored it away, and was happy. Two years later I opened up the box to show a friend, and I was dismayed to see a white powder near the base of the crystal. The color seemed as great as ever, but what the heck was the white powder, and what did it portend for the demise of my great specimen? I removed the white powder with a tooth brush and x-rayed it; I found it was arsenic oxide. This seemed mysterious to me, and started me down a path of understanding the complex chemistry and physics of proustite. Since that first purchase long ago, I have added about 15 proustites to my collection. I love the species, and even occasionally show the pieces. I have also probably been asked a hundred times on how to reverse the aging of proustite; sadly, just like the human body, a grand chemistry experiment is going on all the time, and although it is possible to delay the darkening of the crystal, the majestic color will eventually change. It is not a mystery, but a testament to the wonderful properties of the element silver. The next two sections of this post are about the structure and color of proustite – they require some faith in quantum mechanics, and for some readers it is best to just jump to the section on The World’s Great Proustite Localities. The color of proustite, and the fact that it fades and decomposes on exposure to sunlight, is a result of its chemistry and crystal structure. 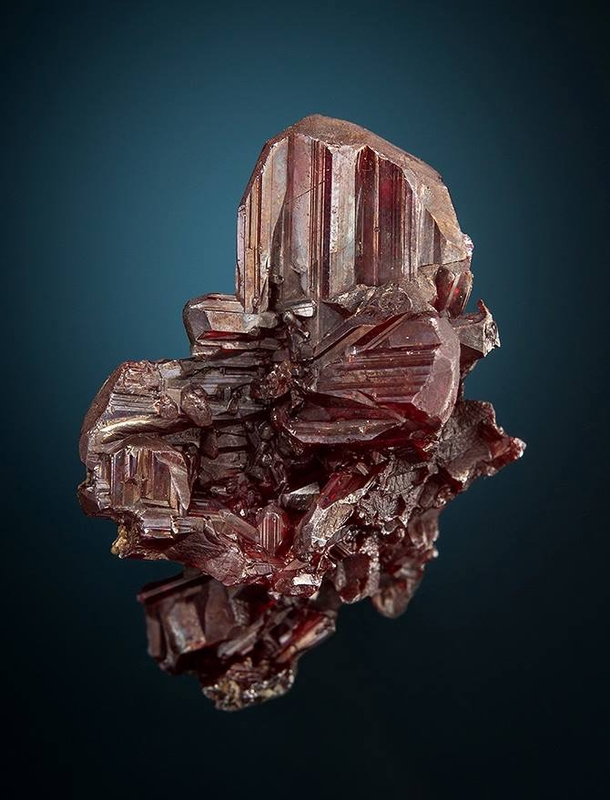 The chemical formula for proustite is Ag3AsS3, which represents the arsenic end-member of a solid solution series with the “dark ruby silver” pyrargyrite (Ag3SbS3). From a chemical point of view, the proustite-pyrargyrite series is one of the simplest silver-bearing sulfosalt systems. “Simple,” however, is relative when dealing with anything that contains silver. For example, in the laboratory it is possible to make antimony-rich proustite; yet in natural proustite, only a tiny fraction of the arsenic is actually replaced by antimony. 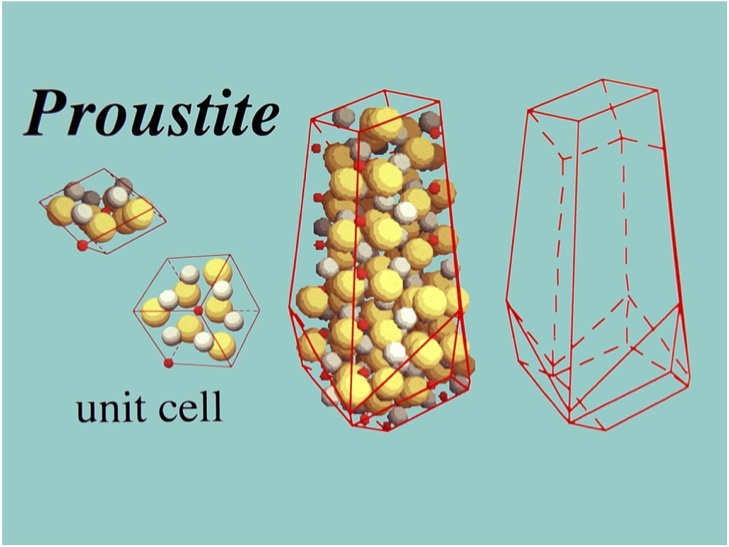 Crystal structure of proustite; shown on the left is the unit cell and in the center is the packing of molecules in a typical crystal shape. Most proustite crystals are prismatic terminated by the scalenohedron and the obtuse rhombohedron. The crystal structure of proustite contains covalently bonded As-S3 pyramids, which are stacked in a spiral parallel to the c-axis of the crystal. The silver atoms are situated between the As-S3 pyramids, and link the over and underlying pyramids via S-Ag-S bonds. 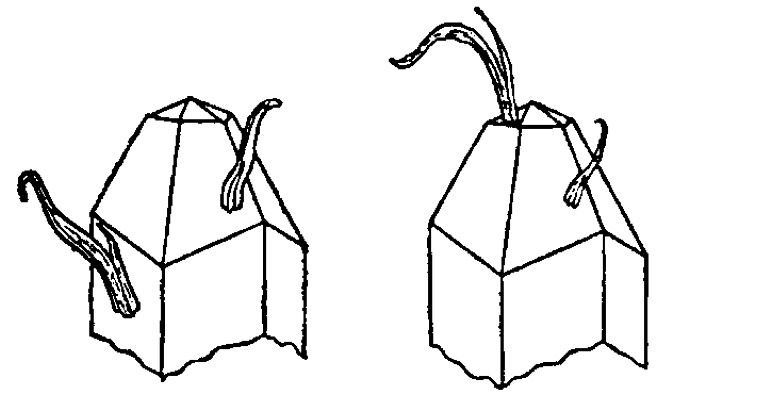 The figure above shows the packing, and the resulting crystal symmetry. The stack of the unit cells gives a hexagonal structure (in the ditrigonal pyramidal class). Proustite crystals are typically highly modified scalenohedrons – often they resemble “dog-tooth” calcite crystals. Prismatic proustite crystals, St. Andresberg, Harz, Germany. The cluster of crystals is 1.6 cm across. Jesse La Plante photograph. The classical representation of the atomic interactions in the unit cell does not capture the complexity of proustite very well; it is important to take a quantum view, more fully appreciating that the silver atoms are fickle with their attachment to a given sulfur atom. Below is an individual proustite molecule presented using Einstein’s model for the harmonic displacement of atoms. 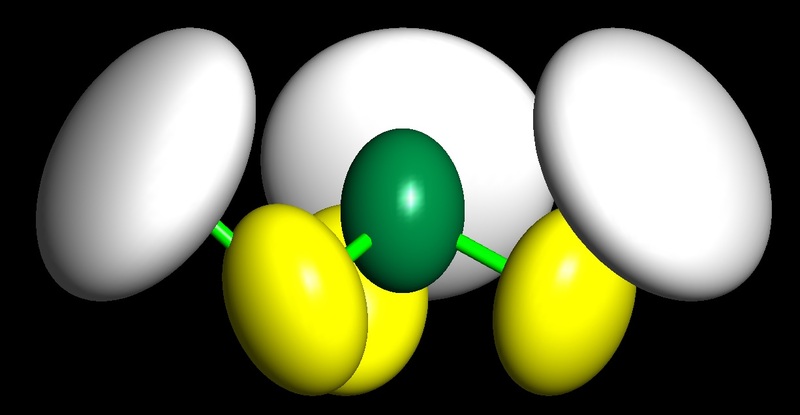 The ellipsoids represent an envelope of space with a certain probability that the atom is inside; in the figure sulfur is shown in yellow, arsenic in green, and silver is the in silver (of course!). The silver atoms have the largest ellipsoids — in fact, larger than the entire As-S3 pyramid dimension — reflecting the fact that silver wanders within the structure. Einstein’s model for the harmonic displacement of the atoms within a proustite molecule. The sulfur atoms are shown as yellow and arsenic as green, and the silver atoms are the large ellipse on the outside. This figure was made by Robert Downs, UofA mineralogist, a structural guru. In the classical description of the proustite structure a given silver atom interacts with two sulfur atoms (on the over and underlying As-S3 pyramid). However, if you consider the interactions of a given Ag atom with the neighboring six sulfur atoms, it is possible to define a very distorted AgS6 octahedral group. Interaction of silver atoms in proustite with neighboring sulfurs. On the left image, there are two bonds which are vertical and the four non-bonded S are in the horizontal plane. In the right image, the view is down the direction of the vertical bonds; the image shows the flat pancake shaped displacement ellipsoid which “cages” the silver. Figure courtesy of Bob Downs. In this representation two of the S atoms are much closer to the silver atom as compared to the other four (making the silver 2-coordinated). The other 4 sulfur atoms form a plane around the Ag, defining a “cage”. When the silver atom experiences thermal motion it bounces back and forth between the four sulfur atoms undergoing short periods of being bonded to each of them. This can lead to strong silver migration within the proustite structure — and this is the root cause of the deterioration of proustite on exposure to light! 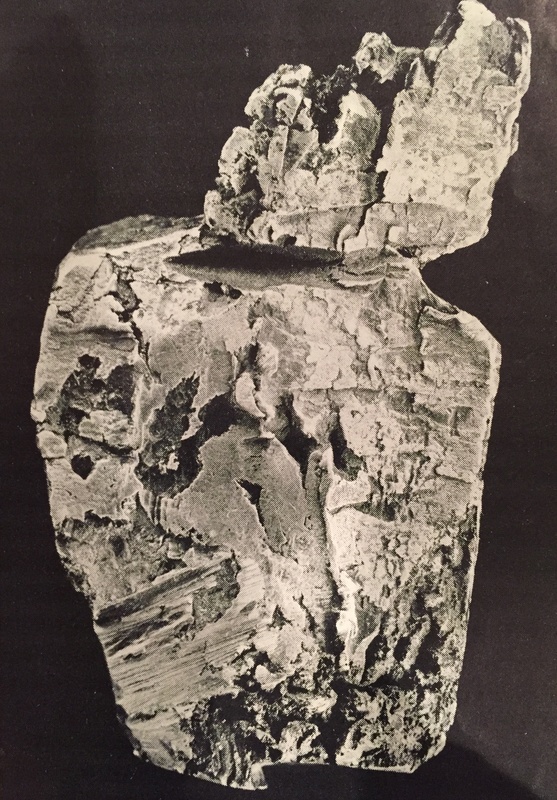 Figure from the 19th century showing the growth of silver wires from proustite crystals. These wires were produced by spot heating — and look very much like the silver wires from acanthite. The mobility of silver in sulfides and sulfosalts is described as a thermal effect, which usually leads one to the conclusion that physical heating is required. In fact, the thermal motion of the silver atoms can be excited by radiation, including visible light. When light shines on proustite the unit cell increases in volume; this volume is accommodated in the c lattice parameter, meaning that the distance between the As-S3 pyramids in adjacent layers increases, promoting a reaction that liberates the arsenic which reacts with the atmosphere to produce As2O3 – the white powder that is sometimes seen on proustite. The light also mobilizes the silver, which typically combines with the sulfur to form acanthite. The “darkening” of proustite on exposure to light is actually the surface growth of acanthite and silver. Proustite cluster from Schneeberg. Specimen is 3.1 cm across. There are a number of silver outgrowths on the proustite. Jesse La Plante photograph. The chemical changes associated with light degradation of proustite are irreversible. Once the silver migrates and reforms on the surface as a new sulfide, the host proustite is forever changed. The “darkening” of the proustite is in fact a surface coating, and it can be removed with silver cleaner, although this “cleaning” leaves a pitted and damaged surface. The mobility of silver in proustite is hardly unique; in fact, all silver sulfides and sulfosalts are temperature sensitive. The classic example is the growth of silver wires out of acanthite. Recently, there have been a large number of “constructed” silver wire specimens from Morocco and China where acanthite crystals have been blow-touched to liberate bright curls of silver. The same thing happens to proustite when point heated, something that has been know since the 19th century when the figure above was published (criminal, blow-touching a proustite crystal!). 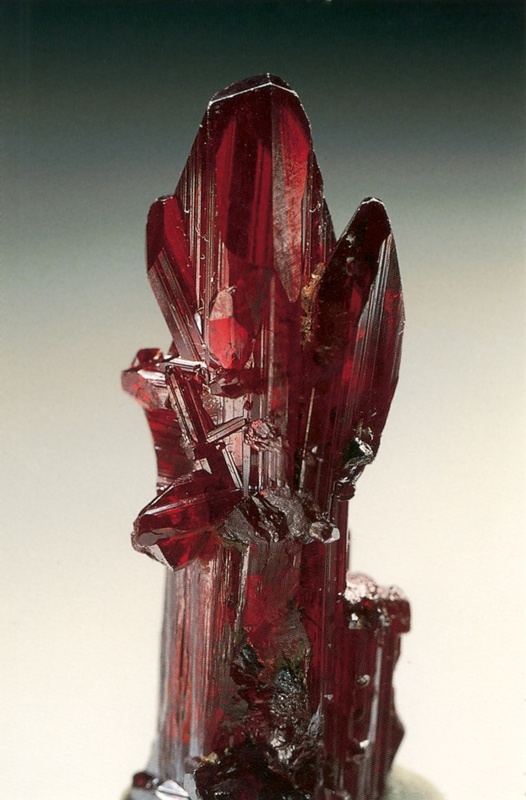 The structure of proustite is also responsible for its marvelous color. It also requires a detour through quantum mechanics to understand how electrons behave with energized. Proustite is a semiconductor, and thus its color is controlled by the energy of electrons and the “band theory of metals”. The main tenet of band theory is that the outermost electrons of the atoms within the mineral belong to the crystal as a whole. For pure metals, such as silver and gold, each atom contributes the electrons in their outer orbits to a “pool”; these electrons are free to move throughout the crystal, and this results in high thermal and electrical conductivity, and metallic luster. For semiconductors – like proustite – there is a prevalence of covalent bonding, or electron sharing. This limits the mobility of electrons, and there are gaps in energy between the covalence band and a band that would be required for the true electronic sharing (the conduction band). The size of this energy gap controls the color of the semi-conductor. Energy gaps, or bands, in minerals and metals. If the gap is nonexistence, there is no band, and the material behaves as a conductor. 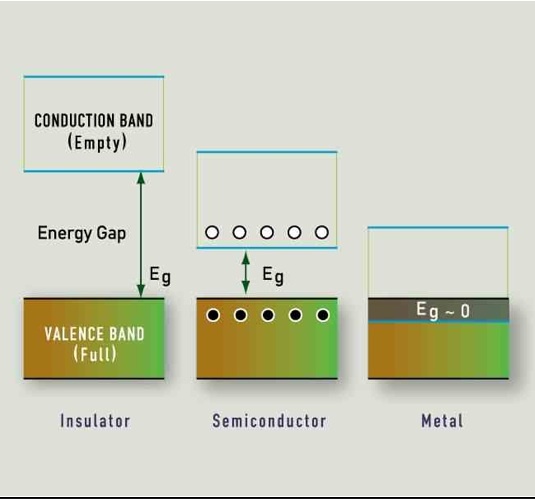 If the gap is small, the material is a semi-conductor. The size of the gap controls the perceived color of the material. For metals, the electron pool absorbs energy from incident light and the electrons are excited to higher energy levels; the electrons return to their native lower energy state and emit a photon of energy proportional to the difference between the excited and native levels. For gold, the electrons have a strong absorption of energy at 2.3 eV, which we observe as yellow. For silver, the absorption peak is at about 4 eV, which is closer to the ultraviolet – so all the visible spectra is returned and the metal acts like a mirror. Hence the shiny, nearly white color of the metal. Color table for semi-conductors. 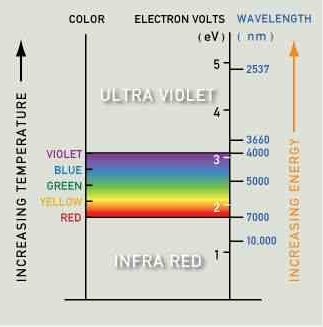 The visible light spectrum covers a range of energies, and absorption is possible at all energies above the band-gap of the material, but not below. If the gap is very small (<1.5 eV) then all the light energies are absorbed and a black color is observed. For semiconductors, it is only possible to absorb the energies of incident light at all energies above the band gap, but not below. If the gap is very small, the color appears black. If the gap is very large, no absorption occurs, and the mineral appears colorless. Diamond has an energy gap of 5.5 eV, well beyond the spectra of visible light. Proustite has an intermediate gap – about 2 eV — and therefore only red light is transmitted; all other colors have energies larger than Eg and thus, are absorbed. Pyrargyrite has slightly smaller gap (the difference between a covalent bond with antimony vs arsenic) and therefore is slightly darker. The unique hue of proustite is a product of silver-sulfur bonds competing with the arsenic-sulfide pyramids. Since most silver sulfides and sulfosalts are similarly constructed, they all have a red color. We tend to think of minerals like miargyrite and polybasite as “black”, but in fact their streak is red. Proustite is known from thousands of localities, but only a paltry half dozen have produce collector specimens of note. Proustite and pyrargyrite are generally late forming minerals in hypogene (high temperature and pressure fluids) environments, although occasionally there found in supergene (near surface, and typically controlled by meteoric waters) environments. Proustite is considerably rarer than pyrargyrite; both minerals are typically dispersed in smallish grains within vein systems. The abundance of proustite in world-wide silver localities portends that there should be exceptional crystals from many localities. However, macro-crystals are quite rare except at Chanarcillo, Chile and near Schneeberg, Germany. Chanarcillo: The undisputed heavy weight champion of proustite localities is Chanarcillo, Chile. Between 1850 and 1875 an extraordinary number of terminated, undamaged proustites were recovered in veins of calcite. 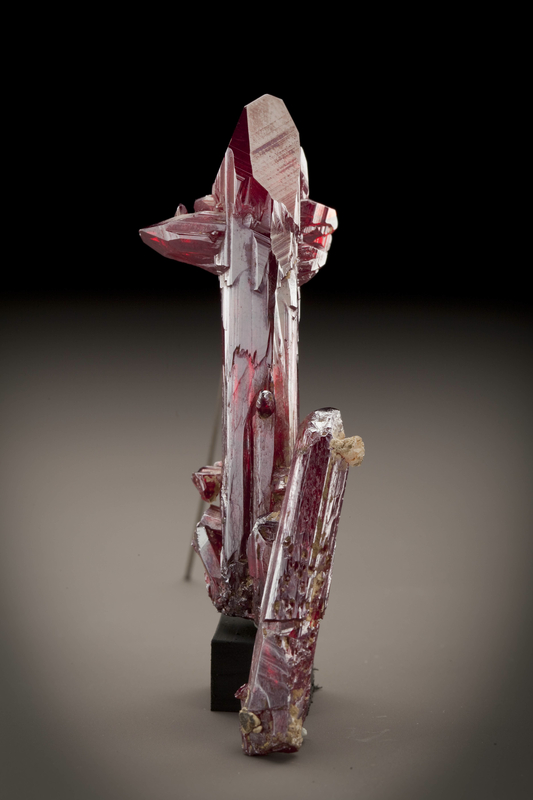 The largest of these crystals is reported to be more than 9 cm in length, and hundreds of specimens are known in museums and private collections across the globe that are long prismatic candles of red in excess of 5 cm length. Proustite, Chanarcillo, Chile. This specimen was originally in the Vaux collection, and is now in the National Collection at the Smithsonian Institution. The main crystal is a little longer than 7 cm. Photograph provided by Paul Powhat. The Chanarcillo deposits are located south of Copiapo, about halfway between Antofagasta and Santiago, Chile, in the Atacama Desert. In May 1832 a freight hauler and prospector named Juan Godoy was hunting Ilamas when he tired and decided to rest under the shade of an outcrop. Godoy noticed a waxy vein and began to pry the vein material out with his knife – he later described it as “soft as cheese”. He loaded up two mules with the ore — chlorargyrite — and headed to the nearby town of Copiapo to have it assayed. Godoy entered into partnership with a friend, Juan Callejos Miguel Gallo, and founded the Descubridora mine. Rumors of the richness of the strike started a rush to Chanarcillo, and by 1850 there were 1,750 mires in the district. Unfortunately, the story of Godoy ends sadly, in the way of many prospectors; Miguel Gallo became immensely wealthy, but Godoy squandered his share of the Descubridora and died a beggar. Vaux proustite, National Collection, Smithsonian Institution. 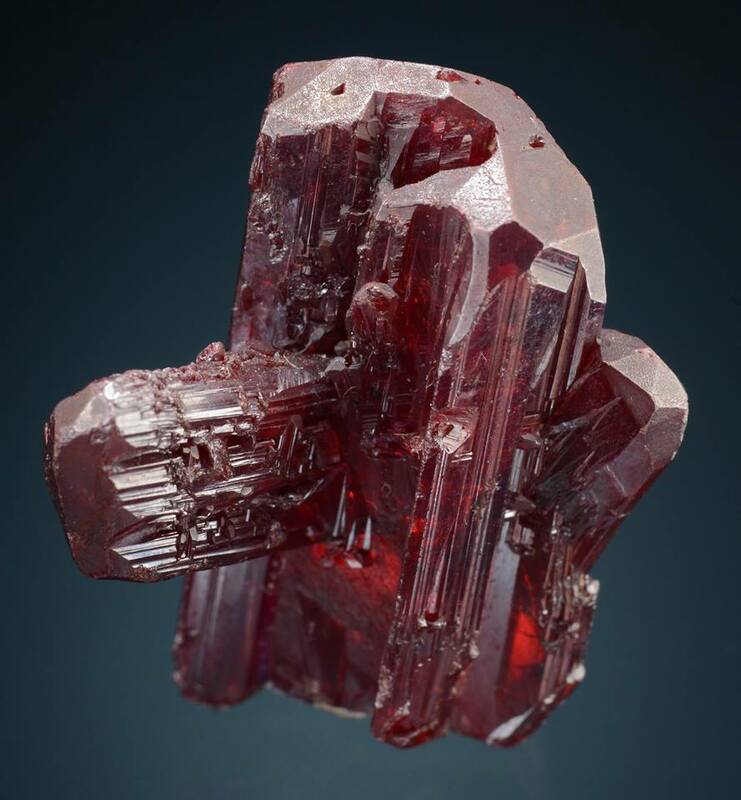 This specimen, thought to be from the Dolores Mine, is about 4 cm high, and cherry red. The photo was taken by Wendell Wilson in 1972 – at the very beginning of his illustrious career as a mineral artist, photographer, scholar, and editor. The Descubridora Mine produced the largest and best native silver specimens from Chanarcillo. Much of the silver occurred as thick wires encased in calcite, but the most characteristic habit is arborescent “flags” or herringbone plates of crystals. Two other mines produced specimens of note: the Mina Dolores Tercera and the Bolados. The Dolores is perhaps the most famous to mineral collectors, and during the 1850s the lower levels of the mine encountered a series of vugs filled with proustite, acanthite and chlorargyrite. The Bolados (named after four brothers who discovered it) contained huge masses of native silver — one of these weighed an estimated 1,360 kilograms, and had to be hand-chiseled from the mine because black powder blasts only dented and bent the lode. Another Bolados bonaza pocket contained chloragyrite and silver weighing 20,450 kilograms! 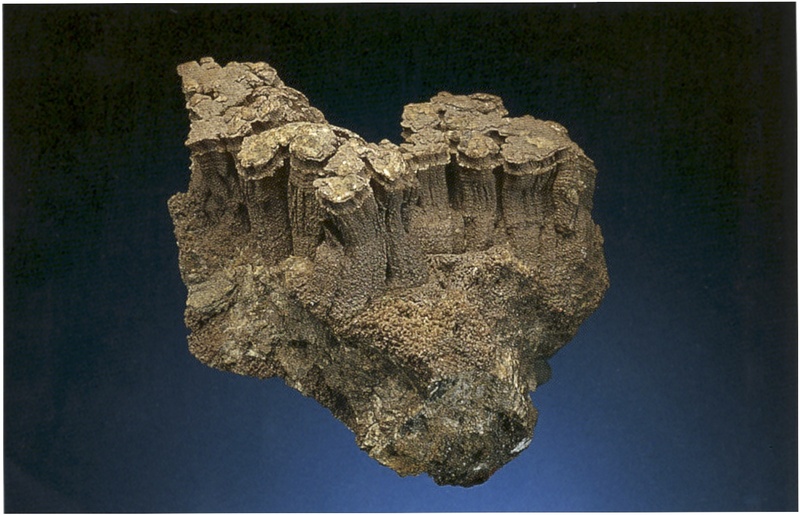 Chlorargyrite from Chanarcillo, Chile, about 6 cm across. I obtained this from Cal Graeber in 1999, and although it is just labeled as “Chanarcillo”, the date of the original label and form suggests it was from the Bolados Mine. There were 18 major mines in Chanarcillo that produced more than $90 million (as measured in 1875 dollars) worth of silver in aggregate. Most mining was abandoned by the end of the nineteenth century due to the exhausting of the ore. There were periodic attempts to revive the camp in the camp in the 20th century, but this only resulted in all the dumps being hauled away for processing. Every trace of mineralization has been chipped away from the tunnels and open workings. I visited Chanarcillo in 2001, and was amazed how little remained. 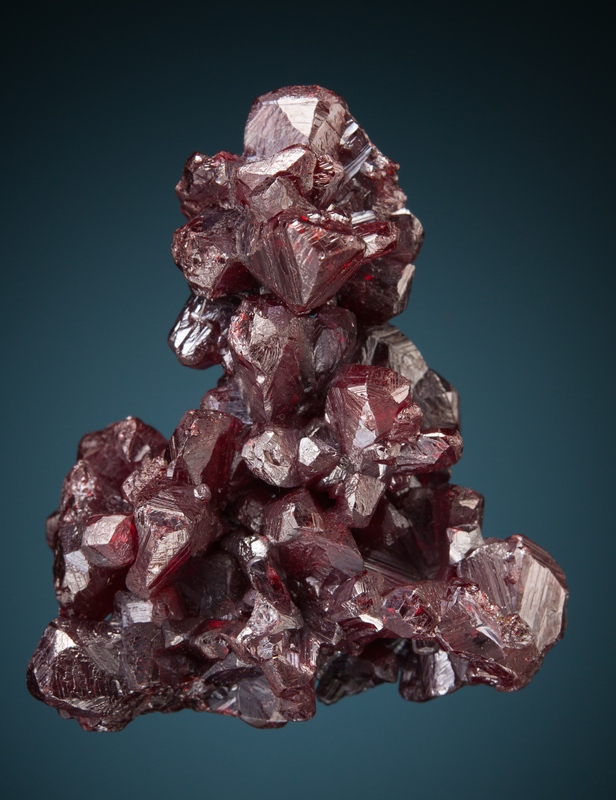 The value of the proustite is not lost on the locals; if you travel to Copiapo and inquire about buying proustite, someone will show up at your hotel room with red-colored rock and asking price of thousands of dollars. Sadly, no new proustite has been recovered in more than a century. Fettelite crystal group, Chanarcillo, Chile. The largest crystals are 0.7 cm across. Jesse La Plante photograph. However, there are plenty of Chanarcillo proustites stored away in museums, and occasionally returned to the collector world. About 12 years ago a large proustite was traded out of the Harvard Museum; as traded it was an ugly clod. It was a mass of calcite with glimmers of proustite. The dealer made the trade with the hope that the removal of the calcite would reveal a masterpiece. In fact, it revealed many masterpieces! During the cleaning it also revealed some material that looked like red mica. Testing confirmed it was fettelite, a rare silver-mercury sulfosalt (Ag16HgAs4S15). Fettelite was only described in 1994, and all the known material was flakes less than .2 mm across. However, the “cleaned” Harvard piece yielded crystal books to .7 cm! I was fortunate to acquire the very best of these (before others decided that these should be really expensive since they were the world’s best!). Proustite, Schlema, Germany. Specimen height is 5.0 cm tall. Jesse La Plante photograph. Schneeberg/Schlema: The Erzgebirge — translates as the ore mountains – is a fault block mountain range that forms the border between southeastern Germany and the Czech Republic. 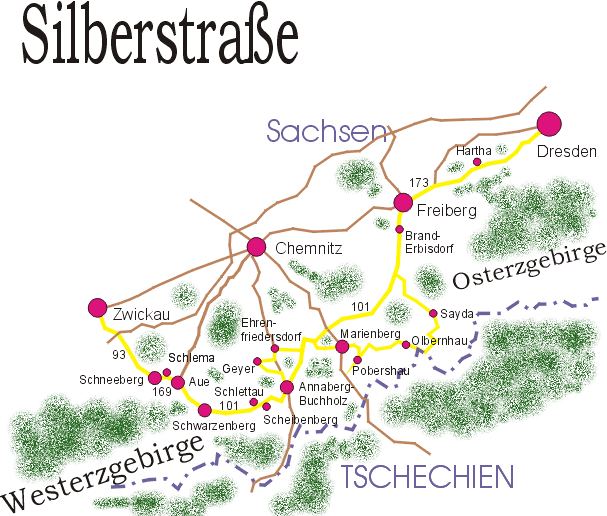 For mineral collectors, The Erzgebirge is a mineral locality of mythical proportions; Freiberg, Marienberg, Annaberg, Jachymov, Johanngeorgenstadt, Pöhla and Schneeberg. These mines operated for centuries, and gave birth to modern mining geology, engineering and mineralogy. These mines produced a larger volume of world class silver minerals than any where else on the globe – and so many of these specimens are preserved because of the rise of gentlemen naturalist that were ravenous collectors in the 18th century had access to these marvels. The “silver road” – a journey through the most amazing silver mineral localities in the world. The yellow line traces the route from Dresden to Schneeberg. I had the privilege to make this pilgrimage in 1991, shortly after the fall of the Berlin Wall. Proustite is found throughout the Erzgebirge, but a series of mines in the Schlema valley produced the very best specimens. The town of Schneeberg sits at the western end of a small valley — about 5 km long — that drains into the Zwickau Mulde (river). Within this modest strip of land sits the Schlema-Hartenstein and Schneeberg mining districts. Silver was known to have been mined in the area from at least since the beginning of the 15th century, and the first major discovery occurred in 1470. Within 4 years there were 176 mines recorded to be producing silver. The most famous of the early mines was the St. Georg; in 1477 a large lode of native silver and various silver sulfides was discovered which is said to have contained 20,000 kg of silver. A large slice of this lode exists today in the Senckenberg Natural History Collections, in Dresden. A piece of the 20,000 kg silver lode discovered in 1477 in the St. Georg mine in Schneeberg. Photograph by Barbara Bastian. The mines in the Schneeberg-Schlema area exploit a network of hundreds of veins that vary in size; the most important are over 2 km in length and 3 meters wide. The character of the mineralization within in the veins is complex which is the result of the superposition of multiple hydrothermal events over a long period of time — from the Permian to the Cretaceous. The complex mineralogy is characterized by the metals C0-Ni-Bi-Ag-U. In fact, the variety of metals also explains the long mining history of the region. Within 25 years of the first major discovery most of the silver mining had ended, but the region was revitalized in 1520 when cobalt became an important commodity to produce blue glass. In the early part of the 19th century the focus of the mining shifted to nickel, and by 1830 the uranium became a main mining target. 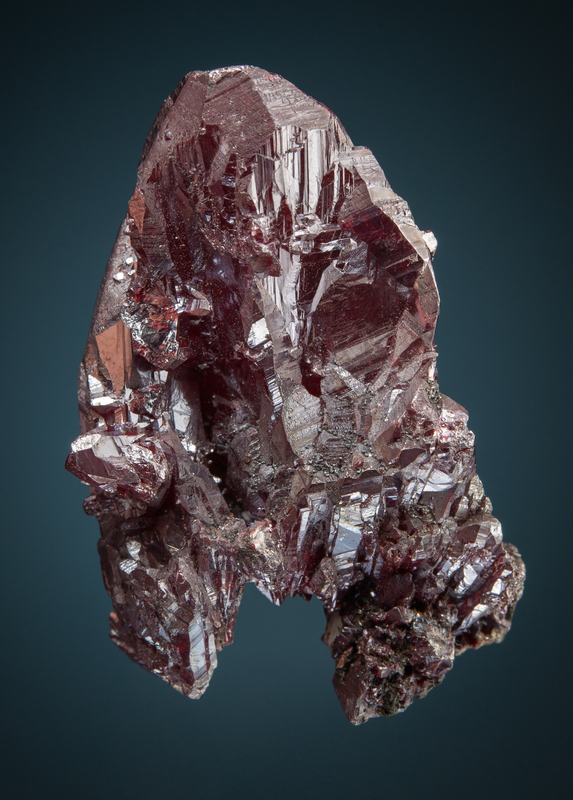 Proustite, Schneeberg, Germany. Crystal 2.7 cm tall. Jesse La Plante photograph. After the conclusion of World War II the Soviets invested heavily in the region to mine uranium for their nascent nuclear weapons program. By the end of the 1950s East Germany was the fourth largest producer of uranium, and the Schneeberg-Schlema area is now recognized as the largest vein-style uranium deposit in the world. By the time the mines shut down in 1990 the total uranium production was more than 96,000 tonnes. Waste dumps from the mining of uranium above Schlema. Photo was taken in 1960 (from the German government agency responsible for remediation). Although the Schneeberg-Schlema mines had a complicated history in terms of the target metal, a constant through time was the occasional encounter with rich pods of silver ore. Proustite specimens were documented as being recovered from the mines for over 500 years. Many of the best specimens were recovered in the 20th century, and preserved. Unfortunately, the names of the specific mines are often obscured — in fine Soviet tradition the mines operated post WWII were donated by numbers assigned to the adits or shafts. The most famous of these shafts was “207” located in Niederschlema. WISMUT, the uranium mining enterprise, made a gift of several dozen stunning proustites from shaft 207 to the Technische Universität Bergakademie Freiberg (the Frieberg Mining Academy). These proustites reside in a drawer – hidden from light, but when the proustite drawer is brought out the reaction from collectors is always one of disbelief! 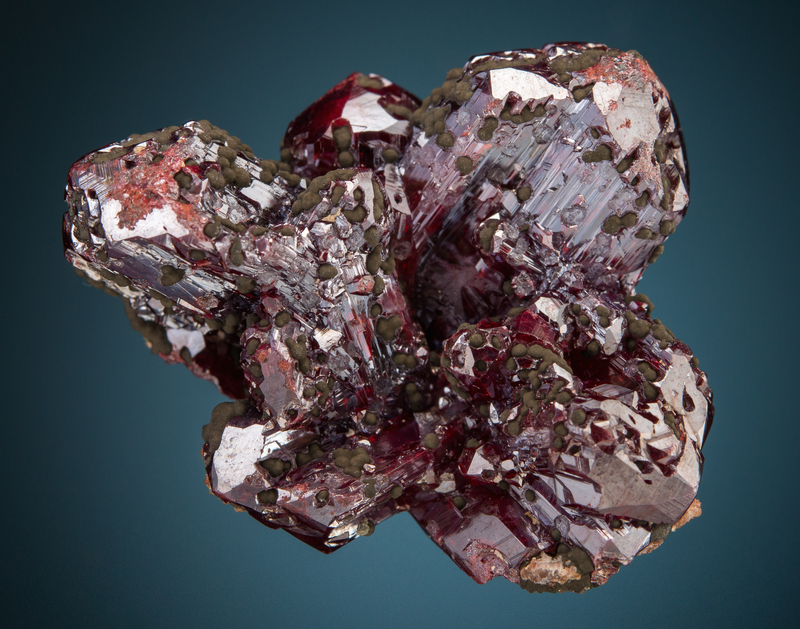 Proustite, Schneeberg, Germany. Crystal height is 3.2 cm. Jesse La Plante photograph. Proustite is a marvelous and complex mineral – to quote Winston Churchill, it is “a riddle, wrapped in a mystery, inside an enigma”. The unique color of proustite demands attention, but each flash of attention under the display lights inevitably permanently changes the specimen. There is no simple solution to delaying the darkening of proustite — the short wavelength end of the spectra causes the reaction to occur more rapidly, but the lattice will swell with exposure to any part of the visible light spectra. Thus, it is not possible to just install UV glass on a mineral case and assume your fine proustites will glow red for a generation. On the other hand, a brief exposure to light for an occasional display has little consequence. Judicious displays — both in frequency and out of direct sunlight – can make poustites objects to behold for at least a hundred years.